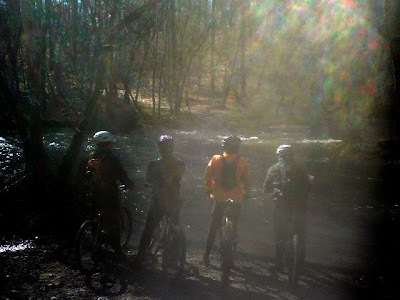 Well, the boys had their training ride on Saturday at Pocohontas State Park. The single track was a little muddy, so they hit Fendley Station Loop. Apparently the water was quite high and somewhat strong. Not like the day when MBM, Dynamo, and I crossed. Here's the link to that post. Here are the boys waiting at the creek contemplating who would go first, what route to take, etc. Apparently, even a little game something like rock, paper, scissors was involved in deciding who the first victim would be. Thanks to our friend, Mario, for the photo. I was attempting to upload some video to share, but there was a little issue converting it. Once I figure it out I'll post it. But...let's just say they all crossed and they all got a little wet on their ride! No riding for me, this weekend unfortunately. On Sunday, we picked up a new piece of furniture instead of riding, which I'm so excited about. But, I'll be back riding next weekend!! I absolutely love the sweet stitches line in the new Spring Occasions Mini from Stampin' Up! It's so vintage and retro, which I love. The paper is so adorable and the colors are fantastic! Don't you agree? This paper is so cute. It's hard to decide which side of the two sides I like the best. Be sure to check out the mini catalog by clicking on the image in the side bar to the right of the blog! It just inspires me to sew! Happy Friday! Never throw away the punched out centers...you may use them like I have here with the heart. They make great frames! Of course I wanted to add more glitter and shimmer, so I used that fabulous red glitter paper from Stampin' Up! All my goodie bags are ready for distribution...and, EARLY!!!!! I feel so ahead! Now, if only I can get all my cards done before the week of! graffiti of my life art journaling class completed!!!! So, a while ago I signed up and downloaded Dina Wakley's Graffiti of My Life online art journaling class. I was so pleased with the techniques that I learned. Dina did an excellent job of teaching her grungy style. I'm going to show you the majority of my finished pages. There are lots of photos...hope you enjoy! I wanted you to see most of the pages and how there is a theme throughout the journal. I chose quotes and words that would inspire me when I read them to include in my journal. Instead of binding my journal by sewing, I chose to use my Zutter Bind-It-All. I really wanted the black rings as opposed to stitching. Maybe on the next one I'll try to bind it by hand. The technique Dina teaches is awesome. I've enjoyed experimenting on other things. I'll show you some of my recent Valentine's Day tags in a day or so using that technique. Hope you enjoyed the journal. I'm very pleased with the results. Yesterday I took my possible last ride on "our" Salsa Moto Rapido. Remember that bike? It was another cold ride. But, with the right gear (i.e. Toasti Toes), it really isn't that bad! The creek was beautiful all iced over! So, back to the Salsa...Well, it hardly gets ridden. It's like having a Corvette, but never driving it. Ever since I got Spot, my single speed, I've neglected my Salsa. Sure, I've felt bad about it, but Spot has been working well for me since I got him. Rarely do I have trouble with my Spot. You just get on and ride. Not much to think about except when to sit and when to stand. So, ever since Dynamo and I have been riding our single speeds, we've neglected our geared bikes. It just doesn't make sense for us to have two nice geared bikes, with no one riding them. So, Dynamo's geared bike is being sold in parts by Carytown Bikes on Ebay. Interested? Go check it out! And, mine may soon be for sale too. Our plan is to build up one geared bike that either of us can ride when, and if, we need gears. Trust me, there are times when gears are needed! I'll share more about the new bike once it arrives. You know I'll be test driving it. It's going to be an awesome color too - Kermit green (we hope)! So, today was a test for me. I hadn't ridden my geared bike on the trails since mid-summer. I could tell I was much stronger and could ride the hills in higher gears than before. I truly believe that Spot has helped to strengthen my leg muscles. Inch by inch, day by day, I've gotten stronger. I'm hopeful that this spring and summer will be filled with faster and longer rides. Practice makes perfect. One of my absolute favorite stamp sets from Stampin' Up! is Wonderful Words. It is my old faithful! Here's a quick thank you card made with the Embrace Life stamp set. It looks a little shiny because you know I love glitter! This is a great card to make multiples of! About 3 years ago, my boss gave me this little black moleskin book. She told me that she liked to carry one around to write down things that she came across that she wanted to remember. Well, I did just that, but it seemed like I wanted the book to be a little more. So, I decided to alter it a little. I collaged the front of the book and added a title to the spine. I had been writing things in my book...mostly quotes from sermons that really made an impact. I also noticed that there were many Bible verses. So, when I titled my book I thought it best to call it what it was, "Comfort and Peace." When I open it, I can turn the pages and read the words and somehow I feel better. I wanted to take the remainder of the blank pages and make them beautiful and more like an art journal. I am also quite the collector of old mini pamphlets. I had found some really neat ones at a yard sale that were focused on prayer related to worry and being of good cheer. So, it seemed fitting to insert these into the book somehow too! So, here are some of the pages. Well, you know that Dynamo got us a new Kodak PlaySport for Christmas, so we've been experimenting with it quite a bit. 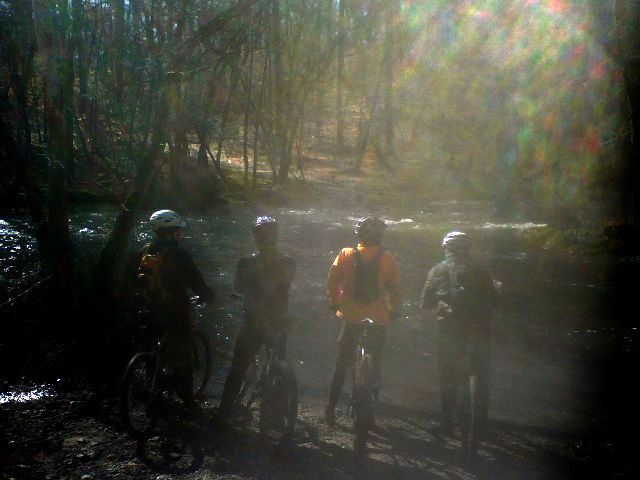 Yesterday, we got out and had a really good ride on the Lakeview Trails at Pocohontas State Park. We were feeling good in the mild 47 degree weather! It was such a pleasant ride together. We met up with MBM, his wife, Lisa, and their girls at Panera for a quick bite to eat before heading to the Park. The trails were a little slippery in some places, but overall the trail conditions were good. It was nice to see people out riding the trails after all this cold snowy weather that kept us all on the fire roads for weeks now. I thought you might like to see a little video clip from our ride on the trails. This clip is from one of my favorite sections of trail on Lakeview 2. They call it Little Moab. I've had pictures on here before of this section, but we were experimenting with video because we hope to put more video of our trail rides out here in the future. Dynamo is going to work on a handlebar mount for the camera for future rides so we can have relatively stable videography too! I must say...when I first starting riding I feared this section of trail. Mainly because I ALWAYS fell when I went through it, but now I've got it down. We finished up around 13 miles! We were pleased with our progress and got outside for a couple of hours to enjoy the fresh January air! Enjoy! Untitled from Rachel Chieppa on Vimeo. With Valentine's Day right around the corner I needed to get to work on my goodie tags for this year.These tags are super quick and easy. All you need are shipping tags from your local office supply store, some scrap paper that looks like V-day, and some stamps! Stampin' Up! has this new red glitter paper that rocks!!! The glitter doesn't fall all over the floor like when you glitterize the paper yourself. You should check it out!!! You will be pleased! All you need is a heart punch and you can make your Valentine's shine! I try to celebrate each holiday with my co-workers, family, and friends by giving them a little something to let them know they're special. I usually give food of some sort! I haven't decided what will accompany my tags yet, but I have an idea! One last tip about creating these tags...DO NOT be a perfectionist! Tear and glue, tear and glue! Don't try to line everything up perfectly. I like the vintage/distressed look. Just go with it! Glitter makes everything better, doesn't it? Have a great weekend!